There is no legitimacy to harming military vehicles, says Yitzhar spokesman after IDF jeep vandalized for the second time in 48 hours. The Shomron (Samaria) community of Yitzhar condemned on Monday evening the latest incident in which the tires of an IDF vehicle were slashed. "We disapprove of this act," said a spokesman for the community. "There is no legitimacy to causing damage to the vehicles of reservists." Monday evening’s incident, which was the second such attack in 48 hours, prompted the IDF and police to open an official investigation. A commander of the IDF’s Samaria Brigade said Monday evening that causing damage to military vehicles ultimately affects the soldiers’ task to protect local communities. 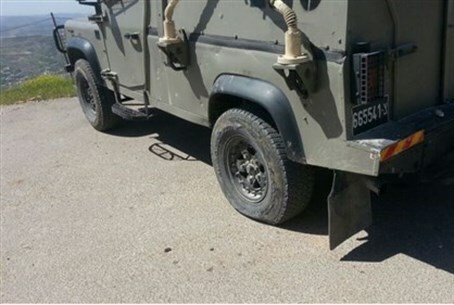 On Sunday, the tires of IDF Samaria Brigade Colonel Yoav Yarom’s jeep were slashed. A suspect, 16, was arrested earlier Monday in Jerusalem. He studies in a yeshiva in the Old City of Jerusalem but is suspected to be linked to Yitzhar. The attack has been linked to local outrage in the community, after the IDF tore down a new house last week belonging to Avi and Shoshana Lazar. The Lazar family was due to move into their new home this week with five children. Meanwhile, the Jerusalem Magistrate's Court sentenced the 16-year-old suspect in Sunday's attack to house arrest on Monday, for a five-day period. The teen was represented by attorneys Barak Friedman and Noam Lieberman, from the NGO rights group Honenu. Prime Minister Binyamin Netanyahu had harshly condemned Sunday’s incident, and used language that is usually reserved for terrorist murderers in reaction.